1. It is time to clean out my closet. Vests that appeared to double as shrubbery suitable for hunters to wear as camouflage in thickly wooded forests WERE stylish . . . a few years ago. I tend to gravitate towards classic styled wardrobe pieces that won't most likely appear outdated overnight. (Thus my avoidance of the cold shoulder look- not to mention that it only accentuates my poor posture). This vest is the exception to that rule. It is the kind of thing that you can't wear too often, because it is just THAT memorable. I wore it a few times - few and far between. I didn't realize that it had 'expired' until I wore it downstairs yesterday before the junior high kids left for school. It was met with loud, dramatic moans . . . followed by a negative, unsolicited commentary. 'You aren't wearing that? Are you?' Curly didn't witness my wardrobe malfunction until after school. She embraced it with gusto. Go figure. bear hunt, belonged to my kids. Making it practically an antique. 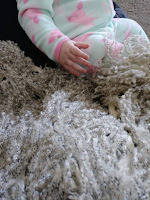 My shaggy vest did keep the tots I sit for entertained. Earlier in the week I orchestrated a bear hunt in our family room. I dug out a handful of bear stuffed toys/beanie babies and hid them in plain sight around the room. 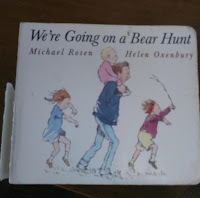 Then I read them parts of one of their favorite board books: 'We're Going on a Bear Hunt'. Each time we came to a new hurdle, like thick oozy mud, I urged them to walk into the family room making the appropriate squelch, squerch sounds as they hunted for the hidden bears. In keeping with the bear hunt theme, I wandered around the table during breakfast in my vest and acted like I was a fluffy bear challenging them to hunt me. Each kid got a turn having the stringy attachments shaken in his face. My bear impersonation received rave reviews. I do prefer the nicer weather for my sitting services. Visiting a park takes a lot of the pressure off of me. A park is a natural form of entertainment - not to mention instantly tiring. Wearing out tots is always a goal of mine. In lieu of outdoor time, I occasionally rise to the occasion with fun indoor activities. Good to know I haven't lost my touch. I will note that when the baby arrived this week and her folks handed me the instructions for her cereal which included lacing it with peanut butter, I felt like a grandma. New techniques like that remind me that my children were born forever ago. I am old. Damn it. I digress. I have found recently that I am gravitating toward the same articles of clothing. Meanwhile there are many other items that just sit there. Occasionally I remember to work them into my rotation, so that I don't feel compelled to give them away. A sign that it is time to purge. 2. Some things should remain on the sale rack. Oh, how I love a deal. I remember that I paid $19 for the aforementioned vest. If memory serves (and despite my advanced age -it usually does), I believe it was initially marked $79. I quickly nicknamed it my 'Chewbacca vest'. Despite the self-deprecating nickname, I still wore it out of the house. I think this time I probably should've slowly backed away from the sales rack. Although, you never know when you might need to pretend you are a bear, Chewy, or a hunter. Ha! I love this! I'm forever finding a bargain on the Target clearance rack and then realizing why it was there when I try to wear it! You sound like a fun babysitter! when it snows it pours? New math or contractor math?